George Spratt and George E. Madeley, China. You are what you eat, you are what you do. 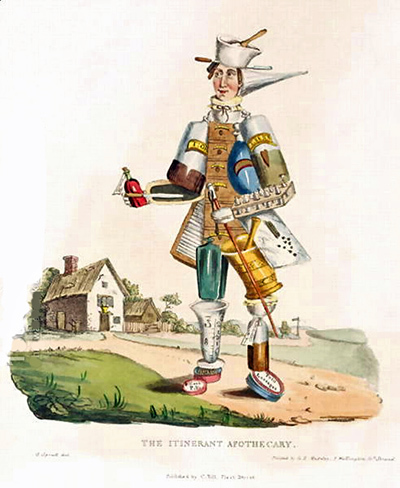 In 1830 - 1833, George Spratt, an English artist, and George E. Madeley, an English engraver and printmaker, produced a series of lithographed satiric designs of tradesmen composed of the objects of their profession. They were published by Charles Tilt, a London book and print seller. 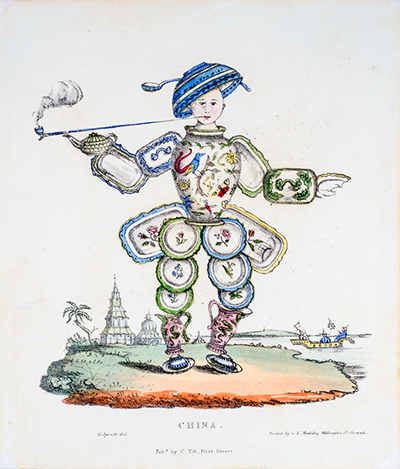 "China," is found in Purcell's Lithographic Drawing Book, published by Tilt in 1831. It depicts a man smoking a pipe, his body a collection of plates, containers, dishes, bowls, cups, saucers, and vases, with his hand as a teapot. "Crockery," which pictures a woman made up of jugs, ewers, plates, teapot, and sauce boats, is also from Purcell's Lithographic Drawing Book. The "Fruiterer" appears in Spratt and Madeley's Figures of Fun (1833). 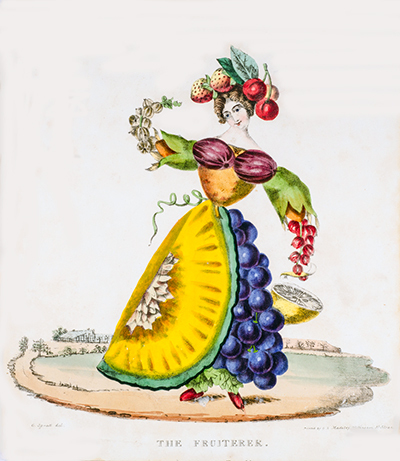 Here, a woman is depicted as a collection of grapes, melons, lemon, plums, cherries and strawberries. Spratt and Madeley, The Fruiterer. Each print is extremely rare, taken from books that have become excessively scare in all likelihood because they were broken up early on to individually sell the plates. Not a trace of Purcell's Lithographic Drawing Book is to be found in any library worldwide, nor is it recorded in any of the standard or unusual references. The only evidence for its existence is publisher Charles Tilt's advertisement for the book at the rear of Landscape Illustrations of the Waverly Novels (London 1831). Of Figures of Fun, only a handful of copies have been accounted for, nearly all incomplete. Gumulchain, in the only reference that we have found for the book, describes it as "so rare that this is the only complete copy... that has come to our notice. The work is inspired by 17th century French engravings done in the same spirit." 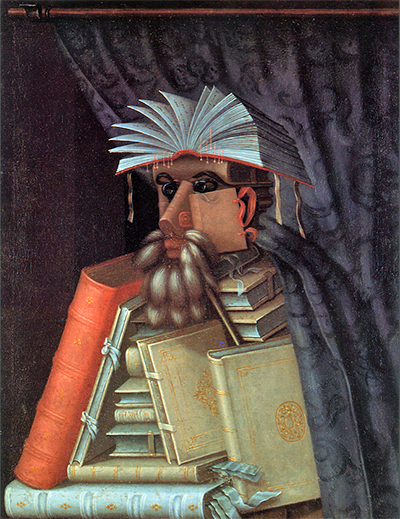 Yet in the sixteenth century Italian painter Giuseppe Arcimboldo (1527-1593) represented the human form with inanimate objects, some of which included tradesmen. 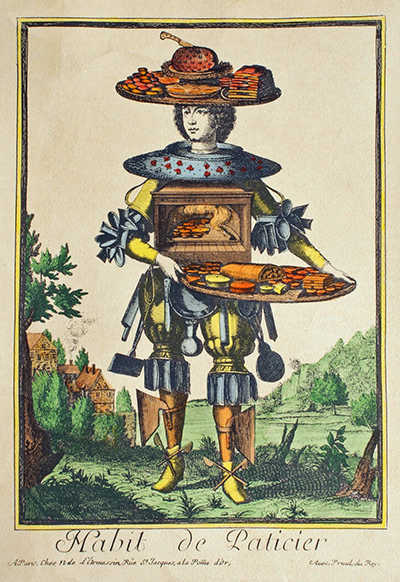 L'Armessin, Habit de Paticier (Dress of the confectioner). In 1695, designer and engraver Nicolas de L'Armessin II's (1638-1694) Costumes Grotesques was published. A series of fantastic plates in which workers and professionals were depicted with the tools and objects of their trade as body parts, it is the work that Gumulchain refers to. Martin Englebrecht, Un Chapetier (A Hatter). 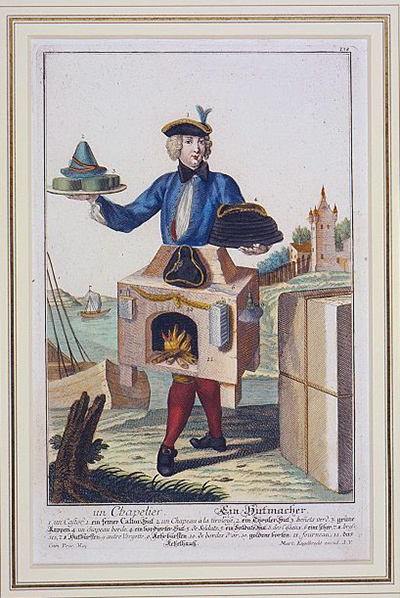 In 1730 Martin Engelbrecht published Assemblage nouveau des manouvries habilles, a series of dessins humoristiques prints inspired by l'Armessin's. And so with Spratt and Madeley we have England's answer to those earlier examples, all collectively known as "personification prints": the objects of trade assembled to create a personification of the trade. George Spratt and George E. Madeley had, earlier, in 1830, produced prints in this genre, i.e. The Itinerant Apothecary. Spratt and Madeley, The Itinerant Apothecary. Medeley was a British artist and lithographer active 1826-1854. Spratt was a British illustrator and surgeon-accoucheur (male midwife), active as an artist 1830-1833, whose Obstetrical Tables (1830) was noteworthy for his use of multiple super-imposed sheets of paper to create a anatomical pop-up effect not unlike that used by Vesalius in 1538. Publisher Charles Tilt (1797-1861), active 1826-1840, was an English bookseller who appears to have specialized in publishing satiric and humorous prints. He issued the satiric caricatures of Henry Heath, and co-published Le Pointevin's classic, Les Diables de Lithographies (1832). The Spratt and Madeley prints are not unusual to find as modern glicé prints. They are quite scarce, however, in their original lithographic form. [SPRATT. G, artist]. Three Hand-Colored Personification Plates. 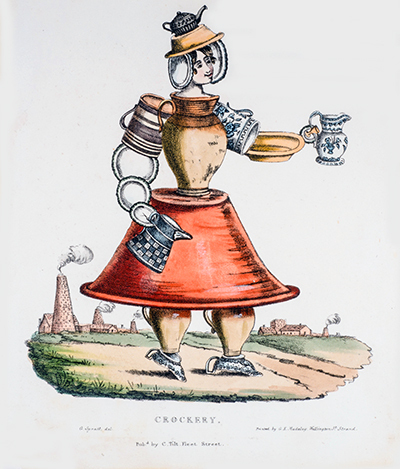 From Purcell's Lithographic Drawing Book: "Crockery," and "China;" and from Figures of Fun: "Fruiterer." London: Charles Tilt, 1831 / 1833. Designed by George Spratt and printed by George E. Madeley. Spratt images courtesy of David Brass Rare Books, with our thanks.